Vice President and Prime Minister of the UAE and Ruler of Dubai His Highness Sheikh Mohammed bin Rashid Al Maktoum and Crown Prince of Abu Dhabi and Deputy Supreme Commander of the UAE Armed Forces His Highness Sheikh Mohamed bin Zayed Al Nahyan, along with Members of the Federal Supreme Council and Rulers of the Emirates, yesterday inaugurated the Etihad (Union) Museum. The Museum is located adjacent to the Union House where the declaration to establish the independent state of the United Arab Emirates and bring into effect a temporary constitution was signed in 1971. The inauguration coincides with the 45th UAE National Day. The inauguration was attended by Member of the Federal Supreme Council and Ruler of Sharjah His Highness Sheikh Sultan bin Mohammed Al Qasimi; Member of the Federal Supreme Council and Ruler of Ajman His Highness Sheikh Humaid bin Rashid Al Nuami; Member of the Federal Supreme Council and Ruler of Fujairah His Highness Sheikh Hamad bin Mohammed Al Sharqi; Member of the Federal Supreme Council and Ruler of Umm Al Quwain His Highness Sheikh Saud bin Rashid Al Mualla; and Member of the Federal Supreme Council and Ruler of Ras Al Khaimah His Highness Sheikh Saud bin Saqr Al Qasimi. photograph was taken at the same spot where a picture of the founding fathers was taken in 1971. Later, Sheikh Mohammed bin Rashid, Sheikh Mohamed bin Zayed and Members of the Federal Supreme Council and Rulers of the Emirates officially inaugurated the Museum which is spread over an area of 26,000 square metres. Crown Prince of Dubai His Highness Sheikh Hamdan bin Mohammed bin Rashid Al Maktoum, and Deputy Prime Minister and Minister of Presidential Affairs His Highness Sheikh Mansour bin Zayed Al Nahyan also attended the inauguration ceremony. Their Highnesses toured the Museum where they were briefed about its different sections by Chairman of the Museum's Advisory Committee His Excellency Mohamed Ahmed Al Mur. The Museum was built underground and is connected with Dar Al Dheafa. The entrance of the new Museum is designed in the shape of a manuscript with seven columns that simulate the pen used to sign the declaration. The museum includes permanent and temporary halls, a theatre, an educational area, a recreational area, administrative offices and car parking. The Etihad Museum comprises eight permanent galleries in addition to a temporary gallery to exhibit items from international museums. Their Highnesses started their tour by visiting the ‘The Journey to Union’ gallery, which features exclusive photos displayed for the first time that were contributed by His Highness Sheikh Hamdan bin Mohammed as part of the 'Let's Preserve the Legacy' campaign. This was followed by a tour of the Museum Theatre, which displays films and audio exhibits. 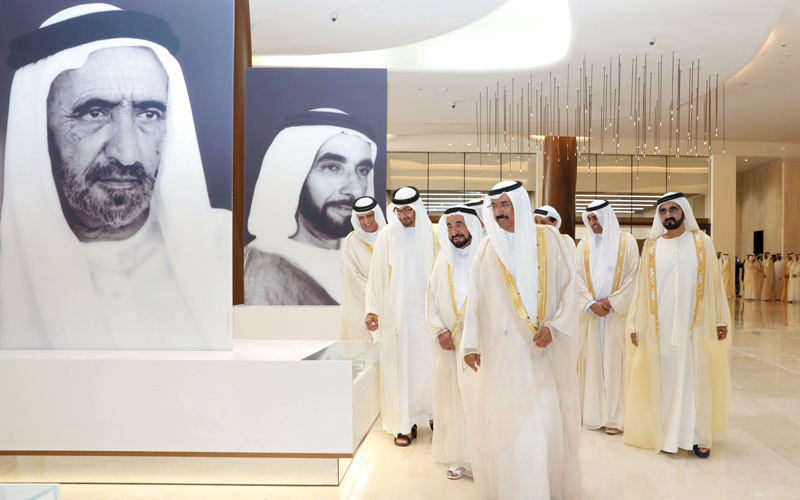 They then visited the ‘Founding Fathers’ gallery, which features photographs of the UAE’s founding fathers, their belongings and an interactive screen that provides historical information about their biography and their family tree. They also visited the ‘Stamp and Postal history’ gallery, which displays stamps dating back to the period between 1909 and 1971. They also viewed an interactive map of the UAE. In addition, they toured ‘The Road to the Union’ exhibition, which highlights the key dates that led to the Union. 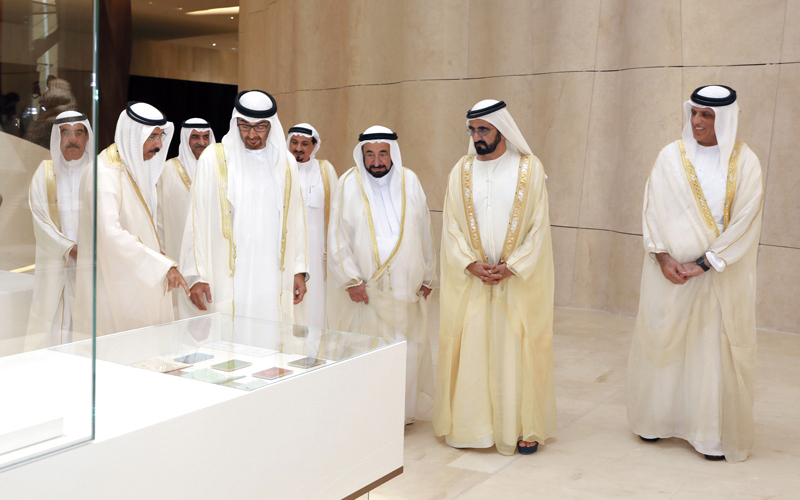 They also toured the ‘Planting the Union’ exhibition, where they watched a holographic movie that depicts the meeting between the late Sheikh Zayed and the late Sheikh Rashid bin Saeed Al Maktoum. The movie is narrated by Sheikh Mohammed bin Rashid. 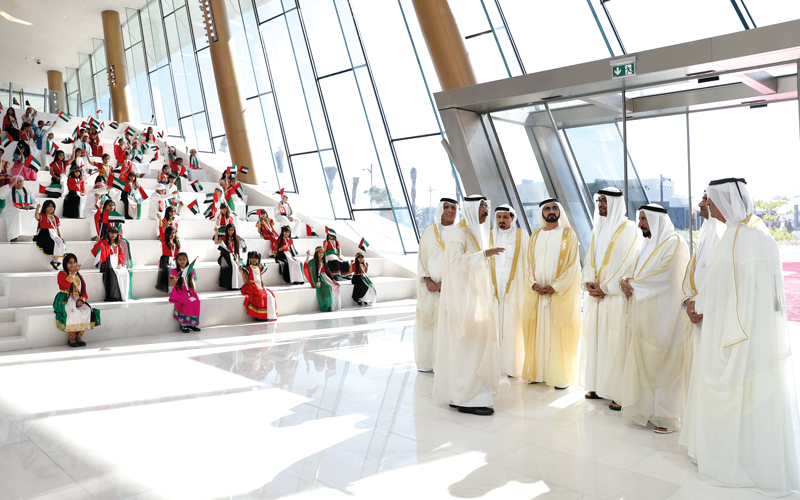 They also toured the galleries titled ‘Change and Independence’, ‘Unification of the Emirates’, ‘The Constitution’, and ‘The UAE: One Nation … Common Future’. They also visited the renovated ‘Al Dhiyafa Palace’. The tour concluded with a lunch reception attended by Their Highnesses, members of the Museum's Advisory Committee and a number of dignitaries. Etihad Museum offers experience-driven exhibitions, interactive programmes and educational presentations that explore the events that culminated in the formation of the Union of the Emirates in 1971, with a key emphasis on the period between 1968 and 1974. Through interactive exhibits and learning programmes, the Museum tells the story of the Union's creation from the perspective of the country's leaders. The experience also aims to educate visitors about the nation's constitution, in particular the rights, privileges and responsibilities that it bestows upon the people of the UAE. The Museum’s collection includes objects and documents related to the events of the formation of the UAE nation. The logo of the Museum is inspired by the oval shape of the Union House. The Museum's Advisory Committee is chaired by Mohamed Ahmed Al Mur. Members of the Committee include Minister for Cabinet Affairs and Future Mohammed bin Abdullah Al Gergawi; Minister of Health and Prevention and Chairman of the Dubai Culture and Arts Authority Abdul Rahman bin Mohammed Al Owais; Minister of State for Foreign Affairs Dr. Anwar bin Mohammed Gargash; Director-General and Chairman of the Board of Executive Directors of Roads and Transport Authority (RTA) Mattar Al Tayer; and the Director-General of the Dubai Department of Tourism and Commerce Marketing Helal Al Marri.